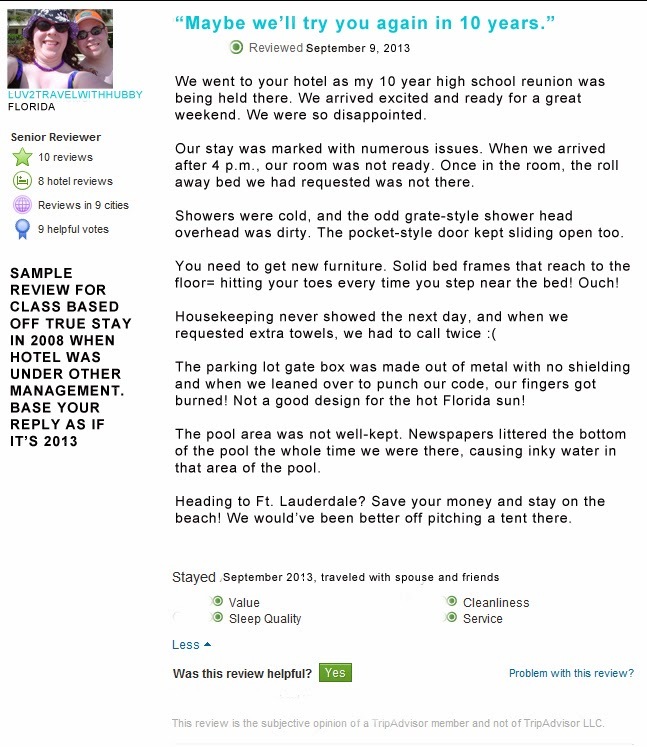 The following are sample TripAdvisor.com posts with replies portraying the appropriate response to customers reviews. These posts do not represent the views of the hotels. They are strictly my own. 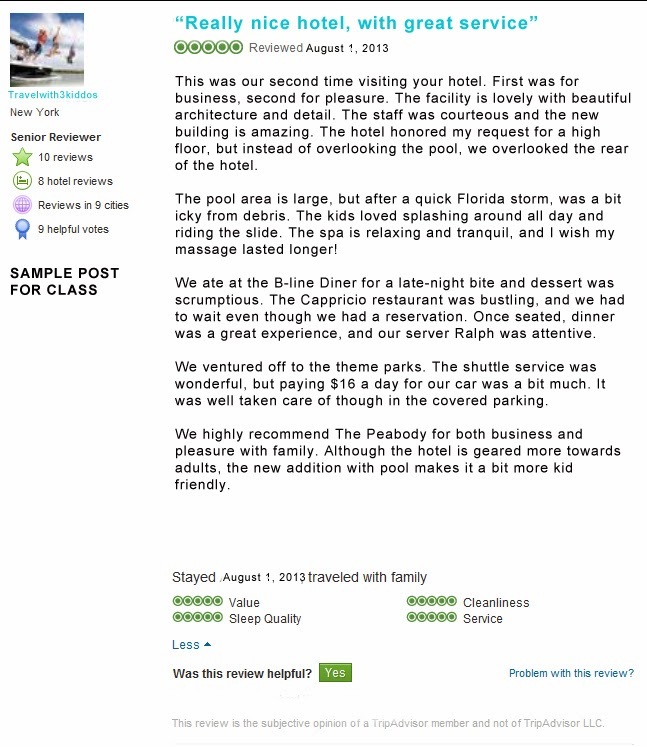 Hello “Travelwith3kiddos” and thank you for such a wonderful review. I am pleased to inform you that we are now the Hyatt Regency Orlando, purchased from The Peabody. With the change in ownership came many wonderful features. As you are aware, we have three pools offering guests the choice to lounge at the luxurious and expansive Grotto Pool with lush landscapes, resort slide and separate children’s area, or swim in serenity at the Terrace Pool, a lap-style swimming pool. If you are looking to enjoy a longer massage, we have Seasonal Spa Specials throughout the year. Currently, we are offering the Around the World in 80 Minutes – Take your personal vacation from reality as you experience the world through a guided tour of massage therapy and aromatherapy. Take a look on our website when you’re ready to return so you can see what our specials are at that time. I’m glad you enjoyed the restaurants here! We love all of our restaurants. If you are looking for the Capriccio Grill the next time you visit, please note that it is now Fiorenzo Italian Steakhouse. It offers steak, chops and a variety of seafood and pasta dishes to delight meat eaters and seafood lovers alike. Because many of our guests wanted to utilize the Trolley but didn’t care for the $16 per night rate for your vehicle, we’ve decided to offer a Park and Ride Package. We know what you want and this package delivers it with these special inclusions: –Complimentary Hotel Valet Parking for One Car –5 I-Ride Trolley Tickets per night. We look forward to your next visit and hope you enjoy our new features here at the Hyatt Regency Orlando! Hello “LUV2TRAVELWITHHUBBY”. Please let me begin by apologizing for your recent experience with us. I would love to be able to find out more about the details of your stay. Please email me personally at hypothetical@emailaddress.com. We never want our guests to leave unhappy. I am looking forward to helping resolve your issues. When responding to reviews online it is important to highlight the good comments but not to dive too deep into the negative comments. You must respond to both and acknowledge the customers. If there is a larger issue to be resolved, offer a platform on which to discuss the issues in private. If you are able to change the unhappy customer’s mind, they will likely update their negative post to reflect your efforts in helping them.